I am grateful for the rainy, cozy, time-for-hot-chocolate-with-marshmallows weather that has come our way, just in time for this special day of giving thanks. I am grateful for my new jeans. I hate shopping for new jeans with a passion, because I never seem to find a pair that isn't too tight, isn't too baggy, isn't too short, or isn't going to trip me up because they're too long. However, in this case, the first pair I grabbed fit perfectly...not too tight, not too baggy, not too short, and I'm able to walk with confidence. And the best part? They were 50% off!! Woohoo!!! I am grateful for my kitties and their quiet friendship and love. Abby, Sam, Mushu, and Emma really are part of the family. I am grateful for the opportunity I have to get an education at ASU. I am grateful for missionary work. I am grateful for my wonderful friends. They light up my life with their kindness, love, quirkiness, and sweet spirits. I am grateful for my family. They have filled my days with laughter and smiles and lots of the good ol' TLC. They have offered me advice and guidance when I have asked for it (and even when I haven't), and I know that I am who I am in large part because of who they are. I am grateful for the gospel and the happiness it brings. I am grateful for the love of my Heavenly Father and my Savior. I am so blessed...and I am grateful. Last Saturday was a beautiful day. The sun was shining, and there was hardly a cloud in the sky. What made it especially beautiful for me, though, was that it was the day I was baptized as a member of The Church of Jesus Christ of Latter-day Saints. The ceremony was so special, with the wonderful talks and lovely music, and the Spirit was so strong. 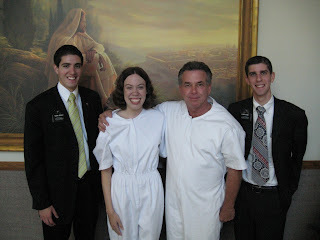 My institute teacher, Brother Wood, performed the baptism. The actual ordinance was quick, but in the Book of Mormon it says "that by small and simple things are great things brought to pass" (Alma 37:6). When I came up out of the water, I felt sooo happy, and I knew I had done the right thing. Having my family there to support me made it all the more special to me. I know how lucky I am to have my family's support, and I am so very grateful for their love and understanding. Later that day, when things had calmed down a bit, I was able to think on my own a bit about what had just happened. I started thinking of some things I had done in the past that I'm not too proud of. I felt this empty feeling, but it wasn't the bad, depressing, something's-missing-in-my-life kind of empty feeling. It was more peaceful than that, and I knew, I was absolutely 100% sure, that I had been forgiven of my sins. The Atonement is incredible!! The next day, I was confirmed in sacrament meeting. It was amazing, and I got to take the sacrament for the first time! This day was very special to my family for another reason, as well, as it would have been my grandma's (my mom's mom) birthday. Even though I never had the chance to meet her, I knew she and my sweet grandpa were there in spirit. I saw this on Madison's blog and thought it might be fun, so here we go!! 3. You must write down the name of the song, no matter how silly it sounds! What do you think of your family? With four weeks left to go, the semester is winding down, and I can see the light at the end of the tunnel. I've been pretty busy over the last several weeks, which is why I haven't posted anything in, like, a month. School has been taking up almost all of my time, but I did get to go to a wedding last weekend!! 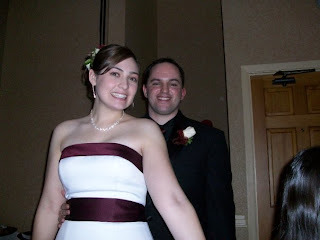 The bride was one of my very favorite Hallmark ladies, Krista. The ceremony was simple but beautiful. I'm so very happy for her and her new husband, Nick, and hope they both find their "happily ever after!" I've also been getting ready for my baptism (2 more days!!! ), and I am so very excited!! It's hard to believe that the day is almost here...a month ago, it felt like ages away! I wish I could say I'm not nervous, but that would be a lie, haha. I'm not having second thoughts about my decision or anything like that. It's just little stuff...I keep finding myself thinking things like, "What if the water's like freezing cold?" and "Don't forget a towel!" Stupid stuff like that (although it's probably a good thing that I'm thinking about the towel, haha!). I know that whatever happens, though, it will still be a day that I will cherish forever...the first step in the beautiful journey back to Heavenly Father. i believe in bubble baths. i believe in reading good books. i believe in family. i believe in sincere friendship. i believe in being happy. i believe in cozy homes. i believe in laughter as the best medicine. i believe in miracles. i believe in thank you notes. i believe in the golden rule. i believe in smiles. i believe in enjoying the little things. Can you afford to be rich? Hancock Renunion 2012 in Carlsbad, CA! October 3, 2011 Final Email!